My mom once gave me a book called "A Journal of Days"... It had dates throughout the book, but not a year, so you could jot things down on different dates and then look back at different events from year-to-year. Similar to a diary, but more of a way to compare... Since I think it's important to have a place to jot down things that you are thankful for -- answered prayers, praises, fun events, moments with friends -- I've wanted to create a journal for this for some time. 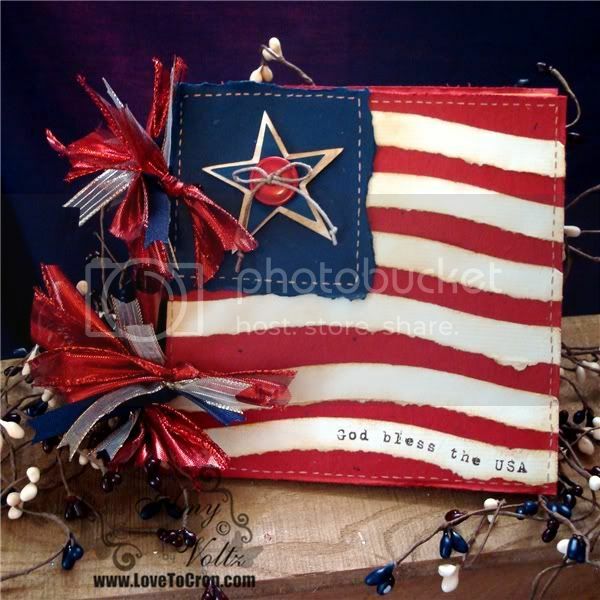 Lynne's invitation to be a guest designer and design something with the "God Bless the USA" theme was a perfect chance to do this. The journal itself measures only 6"x6". 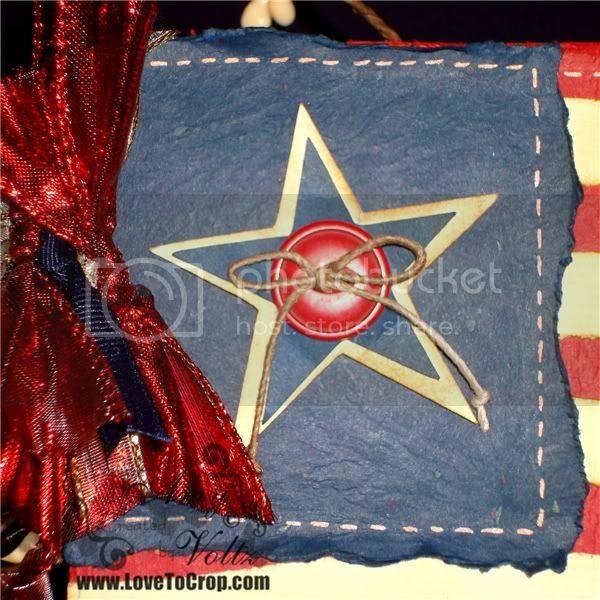 I used two pieces of chipboard for the base and covered it with some handmade red paper. 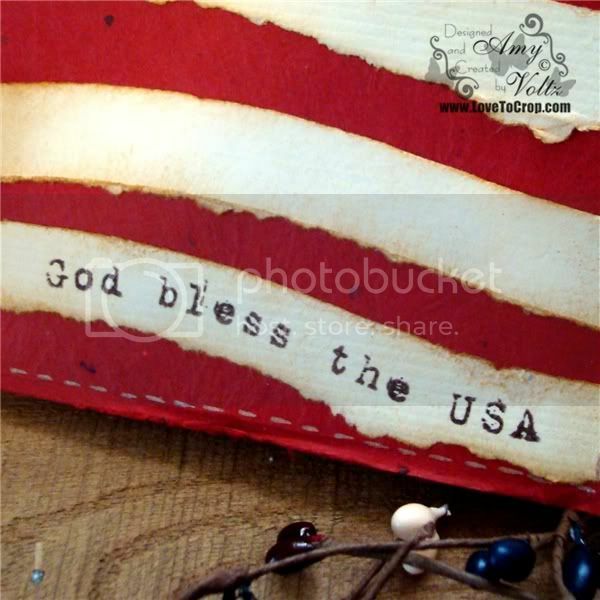 I then tore wavy strips for the flag stripes using my Creative Memories Wavy Tearing Tool and distressed the edges with caramel ink. 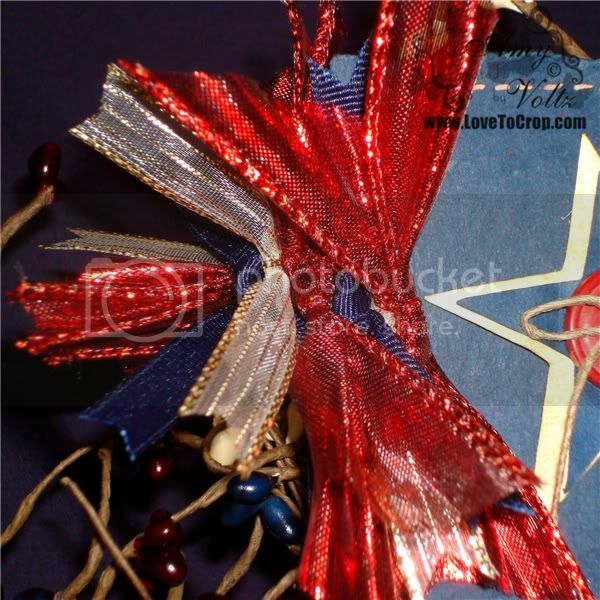 Hop over to Lynne's blog, "Her Craftiness" and leave a comment on my Guest Designer post there -- Be sure to mention that I sent ya... :) I'd love for you to follow Lynne as well!! Beautiful journal. That is such a terrific idea. The handmade papers look kind of vintage and very pretty. The journal is great! The colors always make my spirit lift.. If I had the journal I would record answers to prayer..I think it is such a positive thing to be able to look back and see how God has answered prayer for people that you love or even have only met on the internet..It's a good thing and looking at your journal brings the word "joyful" to my head..
Great journal--I'm thankful to live in a country with so many freedoms! You almost sneaked this one past me, but I was out on "Button Patrol" like I told you I would be. Sending you an email--too much to write here. Duh, I forgot to tell you how much I love the journal, but you already knew that. 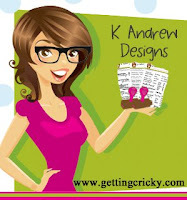 Amy, first congrats on your GD spot with Lynne and I will head over there as soon as I leave you some bloggy love! I am a follower (love your blog and all your inspirational talent, but you already knew that...LOL)! I have your blinkie and would love you to display mine, if you wish. I am thankful for so many things, but to sum it all up, I am thankful that I am surrounded by Love in many aspects (God, family and friends) of my life; that we are blessed to have the things we NEED to be happy; and that my children will cherish things later in life because we are living the simple life now. 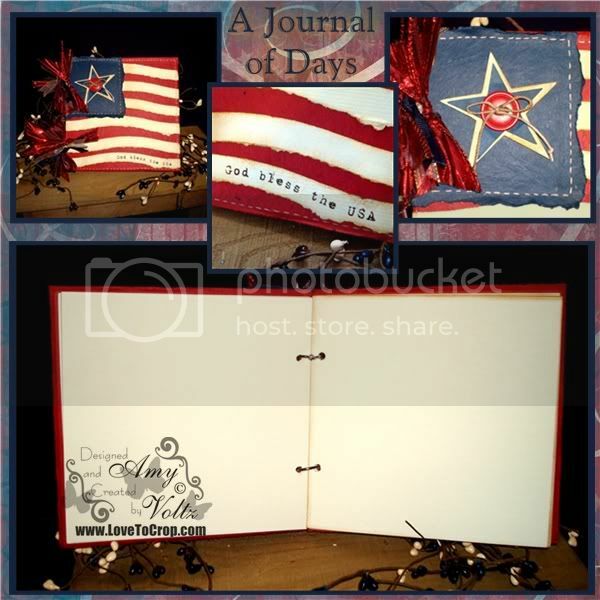 Thanks again for sharing an awesome journal and I think that is a fabulous idea to compare day to day! I am a follower of both blogs and looking forward to more inspiration. i'd prob write how thankful i am for my friends and family.. especially my beautiful niece, bella! beautiful amy it is so pretty. Great project. Love the journal. Thanks for sharing Amy!!! Wow what a wonderful and beautiful Journal! I am thankful for my freedom and that I live in the United States! I am most thankful for the Men and Women that are fighting for our freedom God Bless them one and all! I absolutely LOVE this, Amy! Wow, it is just spectacular! I love how you curved the stamp to match the wavy stripes! Genius! I am so thankful for my wonderful family and all of my wonderful friends, both in "real" life and blogland!! Beautiful journal. This would make great gift ideas. Since my mom is American and my father is Canadian, and I have lived in the US my whole life, I would make the book about the things that I am lucky to have in my life because I live here. My citizenship was in turmoil for awhile, and I am very grateful to be an American. I would dedicate my journal to that. I absolutely L O V E this!!!! 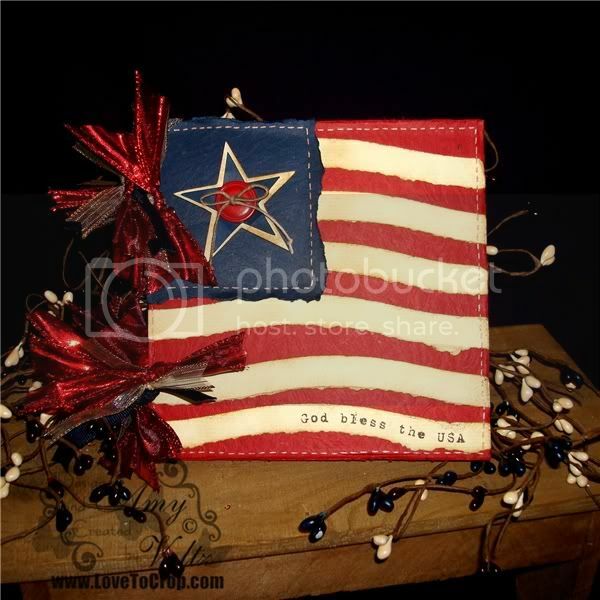 Love anything Patriotic. Your Journal is beautiful and you did an outstanding job creating it...love it. If I would win, I would ask you to send it to someone in the Military or their spouse. Thanks for all you do. I am heading over to Her Craftiness now. I am already a follower and will now add your Blinkie to my little Blog. Great journal! I was married on the 4th Of July so I would write how grateful I am for my Husband! Beautiful Journal!!! I am really thankful to all those in the armed service who are keeping watch and fighting on all the borders across this vast world! Thank you God for giving a free country, and all our blessings!